As a young man I opened Oslo Mynthandel in 1974. I thought I was the biggest expert of coins in the world. After 40 years in the trade I do know that what I know will take generations to know. King Chulalongkorn visited Europe two times, the first time in 1897. At that time the King of Thailand wrote a thank you letter to King Oscar of Sweden and Norway. In the letter King Chulalongkorn mentioned that he enjoyed Sweden so much, but he knew that Norway was such a great country. On the second trip to Europe, King Chulalongkorn was the first Head of State to visit Norway after the reuniting of Sweden. He was welcomed by Norway’s newly elected King, 2nd in line from Denmark, married with Maud, daughter of the King of England. At that time, as it is today, it is important to have good friends. 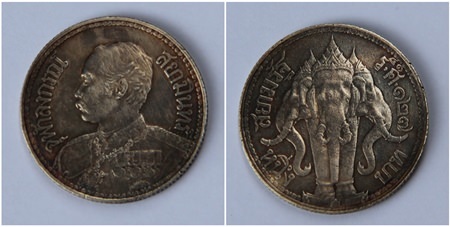 King Chulalongkorn wanted to have a new design for his one baht coin to be produced during his second trip to Europe. The King had his portrait made in Italy, but His Majesty preferred the French artists. The coin was ordered. Unfortunately, His Majesty passed away before the coin was put into circulation. Today it is kept as a memory of a great King. Unfortunately, 99.9% of these coins offered on the market are copies. Mine is not and I hope to get 150,000 baht for it. Have a look at the pictures.